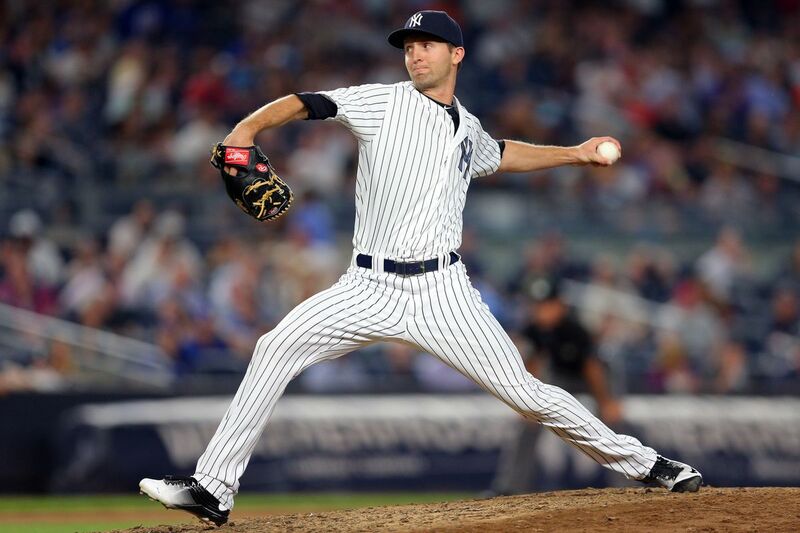 On Tuesday night, the Yankees turned to relievers David Robertson and Chasen Shreve to record the final six outs in a 7-2 victory over the Blue Jays. Robertson and Shreve did it in the way modern-day relievers know how: the strikeout. The duo struck out three batters in two innings. Shreve is posting a career-high 12.36 strikeouts per nine innings, which falls in the top 25 among MLB relievers with more than 10 innings pitched. Robertson has a K/9 of 11.06. Yet, both Shreve’s and Robertson’s strikeout figures are dwarfed by the mammoth duo of Aroldis Chapman and Dellin Betances, who place second and third in the category, respectively. Then add Chad Green, who strikes out 11.57 batters per nine; and Adam Warren, who has struck out 12 batters in 9.2 innings this season. Add it all up, and Yankees relievers are posting the highest K/9 rate of any bullpen … ever. It’s not surprising that, in 2018, a bullpen is on pace to break a strikeout record. Prior to the 2010 season, almost no bullpens struck out more than 10 batters per nine innings. This season, the Yankees (12.13), Brewers (10.41), Astros (10.41) and Mariners (10.38) bullpens are all striking batters out above that clip. Four relieving corps achieved a K/9 of above 10 in 2017 as well. But this isn’t to discredit the Yankees’ feat. A K/9 of 12.13 is still more than one batter per nine better than any past bullpen’s strikeout rate. The Yankees led baseball with a K/9 ratio of 10.92 in 2017 and 10.15 in 2016. To better put the ratio in perspective, I’ll convert the stat into three-inning increments, a more feasible measure of a bullpen’s game-by-game performance. The Brewers can thank the incredible Josh Hader, who is striking out more than two batters per inning (Seriously, Hader has an 18.09 K/9 … Chapman is at 16.42, and Betances’ is 15.48), for their stellar ranking. The Mariners have Edwin Diaz, who comes in fourth with a 14.78 K/9. The Astros don’t have anyone who jumps off the page, but their bullpen generally strikes out a ton of batters. The relief crews for New York, Milwaukee, Houston and Seattle pretty universally top the 2018 statistical leaderboards, and a closer look at these four bullpens shows just how valuable the strikeout is for the Yankees. If you isolate the strikeout, the Brewers, Astros and Mariners bullpens look better than the Yankees. The other units walk fewer batters, give up fewer home runs and leave more runners on base. And of the contact they induce, Brewers, Astros, and Mariners relievers generate more groundballs than Yankees relievers do. In those categories, however, the Yankees aren’t just fighting against the other best three bullpens in baseball. They’re in the middle of the pack, at best. New York ranks 19th in BB/9, 15th in HR/9, 19th in LOB% and 26th in GB%. Contrarily, the Yankees bullpen ranks first in Wins Above Replacement (WAR), at 3.6. And this speaks to the historical strikeout rate its relievers are producing. A handful of measurables suggests that the Yankees’ bullpen is average. But a strikeout rate of more than one batter per inning higher than any other bullpen in history can soundly mask that handful. If Yankees relievers continue to strikeout batters at this wild clip, expect the ‘pen to continue superseding its mediocre non-K stats.